The Hotel Ventura, now called the Ventura Inn (a residential hotel), was built in 1926 on the site of the 1903-1925 City Hall. Once the largest hotel in Ventura, with the city’s second elevator, it was built by Gus Berg who owned the De Riviera Hotel in Santa Barbara. 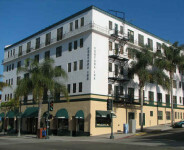 The hotel was designed by the Pasadena firm of Williard, Bell, and Clarence Jay. The building has many Spanish elements seen best in the double-arched entry and columns.